When I learned that I’d be performing in Monmouth, I was thrilled. 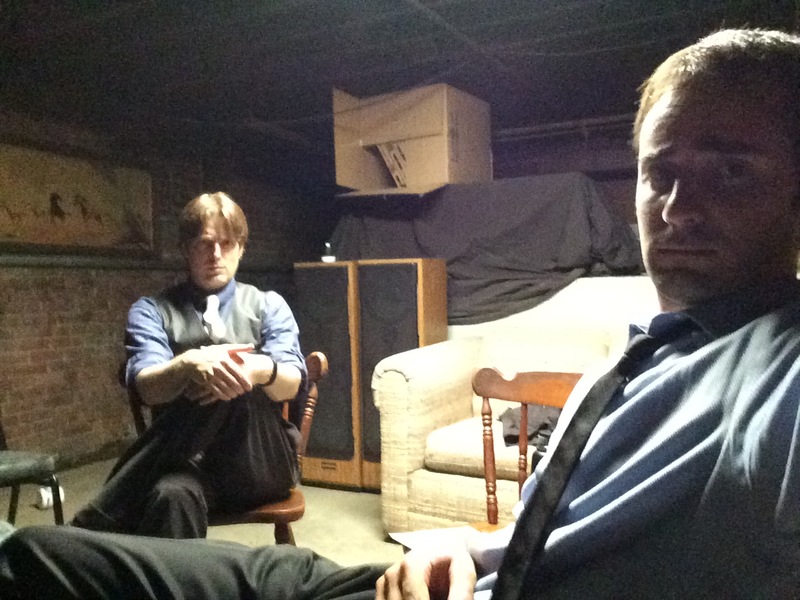 Prior to my career as a dueling pianist with Felix and Fingers, I visited Monmouth often, performing at local venues, such as Market Alley Wines. Monmouth is a neighboring town for me. Although it is about a 45 minute drive, when you live out in the middle of nowhere (as I do,) that is to be expected. Despite the many visits I’ve made to Monmouth, I had never visited the Rivoli theater! In most other towns of this age (in this area,) the historic buildings are falling apart and not maintained any longer. Yet here, this historic theater is just as charming as ever, well-renovated and still hosts events. Teddy Bear Child Development Center is a non-profit organization, that has been teaching, loving, and nurturing children for over 25 years. Fundraising is what makes it possible for them to purchase classroom equipment, supplies, etc. and keep their budget afloat every year. We were happy that we raised over $1100 through tips alone throughout the show. Of course, all of that was donated back to Teddy Bear, and along with ticket sales, and other great events that they hosted that night, I have heard it was a great success! The Rivoli theater originally opened in 1927. At one point it had closed, but after a renovation, it reopened for performances such as our own. “Beware of the Green Room” we were told. Prior to the show, during set up, we were told there was a basement area that we could hang out in. One man seemed to think it was cleaned up, yet he did have a smirk on his face. The other told us to beware. We had to check it out. We loved it and decided if we were ever to branch off into a mafia type organization, this would have to be one of our headquarters. 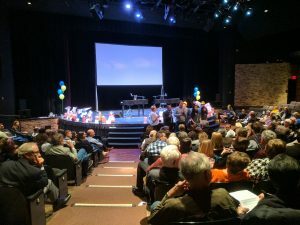 Starting with jazz, we provided light background music, as people ate dinner, browsed silent auction items, and made their way into the theater. 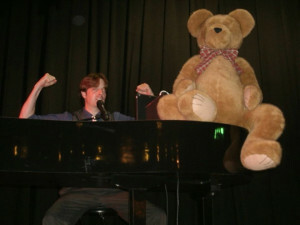 When the show started, “Fingers” put Teddy on my piano. He was pretty good about being attentive and sitting still. But he must have been getting tired, because he took a nose dive off the piano at one point. No problems. I picked him up and we had a quick slow dance together. After that, he was right back on my piano, and attentive as ever. That always makes us feel good. 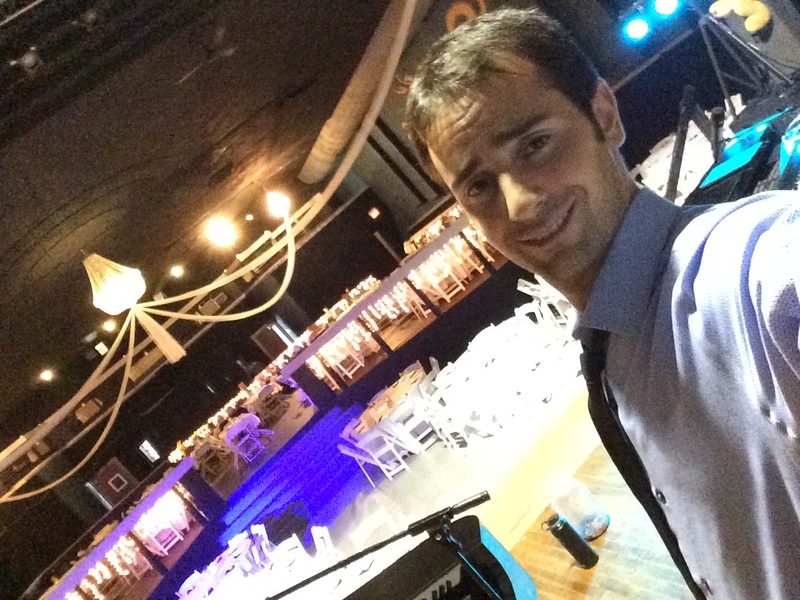 We had a great crowd, great planners, and an incredible venue. We’re already looking forward to the next one. If you happened to miss the first, don’t miss the second! If you were there for the first, come again because no two shows are ever the same! What can we say? Monmouth’s first ever dueling piano show was phenomenal, awesome, non-stop insane fun. The showmanship and talent was top shelf. 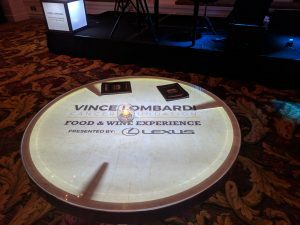 Every aspect of the event far exceeded our expectations. The $1100 in request tips, which were donated back to Teddy Bear, the silent auction raised over $4000 and ticket sales were over the top. Jessica’s office professionalism was key in the planning. Believe it or not, people are still talking about it a month later. 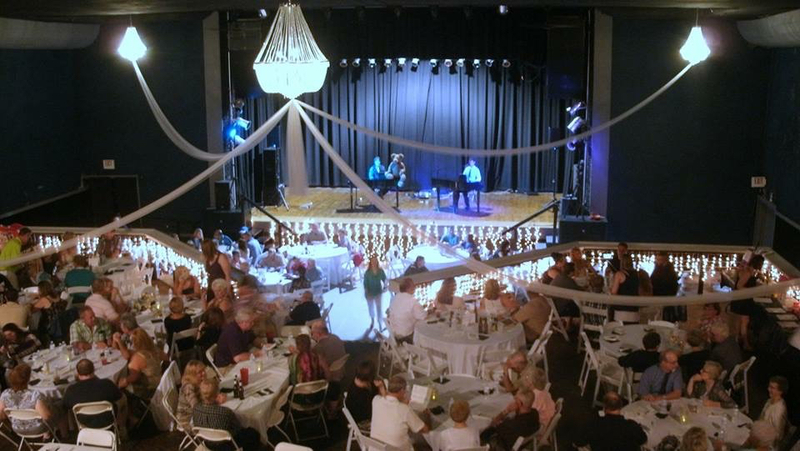 We’ve already booked the guys for a Christmas show and they will be our signature entertainment for our annual summer fundraiser from now on. Can’t wait to see if Santa loses a “ho”. Gotta share this and tell people to save the date!